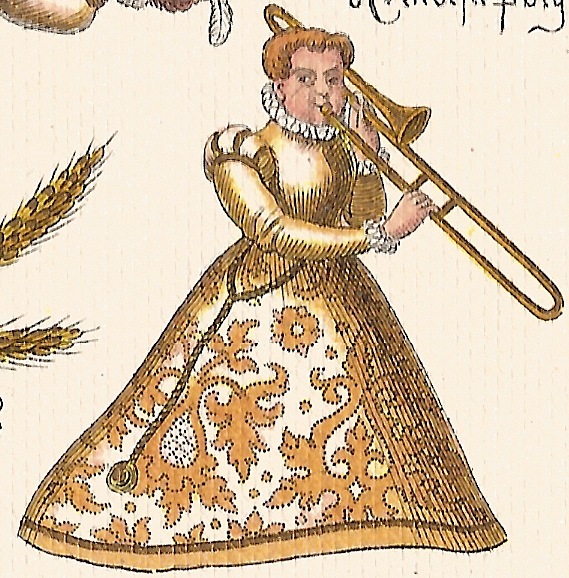 While some earlier instruments like the cornetto have no true “modern” substitute or counterpart, others like the early trombone (or sackbut) have remained relatively unchanged. For an instrument invented in the 15th century, that’s a pretty stellar run. The saying, “If it ain't broke, don’t fix it,” couldn’t be more true in the case of this remarkably *genius* instrument. The name sackbut actually comes from the Old French word saqueboute, which means “pull-push”—the very same mechanism and action required for the instrument to change positions, and shorten or elongate the tubing. That, matched with a precise coordination of the air and lips produces not only the desired pitch, but a very desirable tone. Check out the shots of the sackbuts (#1-4), alongside trumpets and cornetti. From Syntagma Musicum (1614-20) by Michael Praetorius. Paul Von Hoff, our sackbutist (our new favorite made-up word) is, like Bill our cornettist, also a member of Rook and Gaudete Brass Quintet. 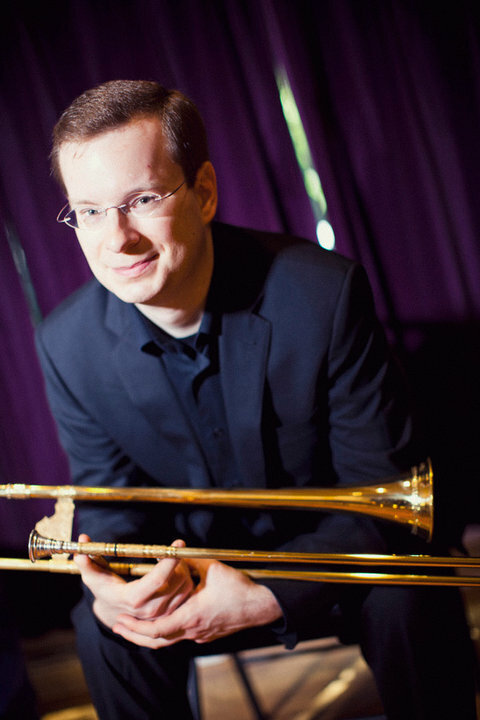 He performs a variety of new music on his trombone and brings to life the music of the 16th and 17th centuries on the sackbut. It’s common that people who are drawn to new music tend to be drawn to very old music, and vice versa. It should also come as no surprise, then, that those same people have an invaluable insight into both worlds and are adept at bringing to life a centuries-old instrument in the 21st century. 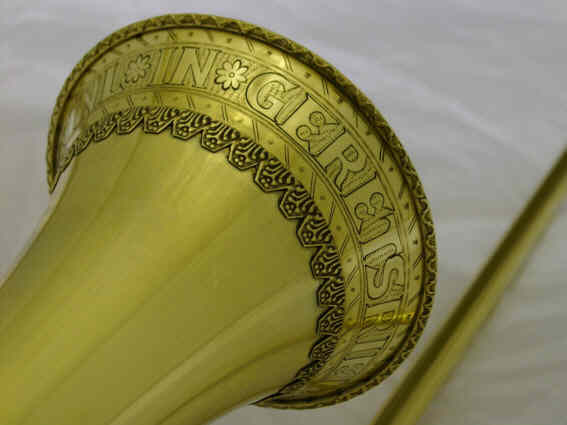 When thinking of the function and advantages of the sackbut, Paul points out the very strong connection it has to the human voice - much like the cornetto. The approach to the sackbut’s sound production doesn't drawn on the powerful sounds like the brass section in the opening theme to Star Wars. Rather, the sackbut's strength is in its ability to play very softly, and blend with other instruments, including the voice. 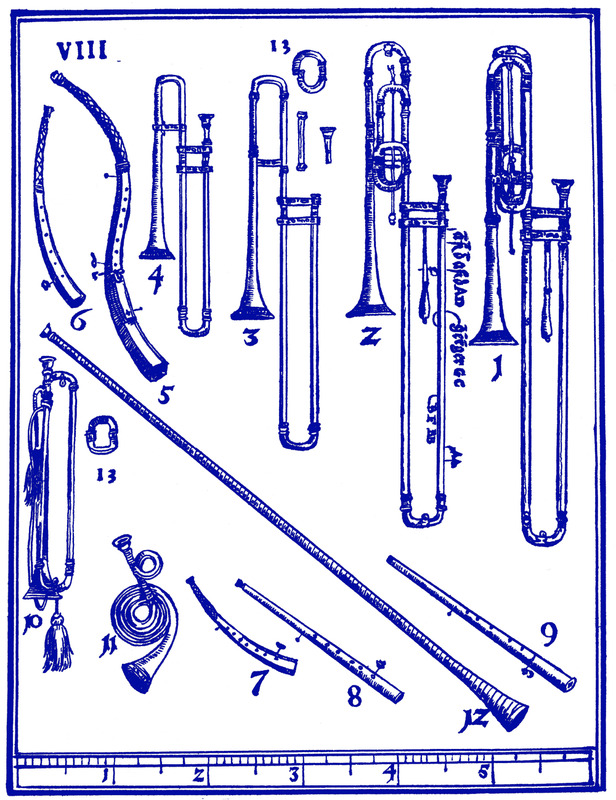 The tenor sackbut is recognized as the most flexible and versatile of the sackbut family. A player like Paul has the ability to showcase its softer side. The sackbut was originally conceived in a family of instruments much like the violin and viol families (more on those coming soon). Because they have ranges similar to the voices found in a choir, they're usually played in consorts (i.e. playing in groups of other and like instruments). For instance, the alto sackbut tended to be in the same range as an alto voice - likewise, the tenor and bass sackbuts as the tenor and bass voices, respectively. Paul Von Hoff, far left, with his group, Rook, an early music group in Chicago. Yes, they're a boy band. Check out this all sackbut and cornetti group, cleverly named The English Cornett and Sackbut Ensemble, playing a piece by Giovanni Garbieli. The sackbut Paul is using for Chicago Stories is a tenor and has a nearly 3 octave range. However, the “money range” - or what I think of as the best notes of that instrument that people pay the "big bucks" to hear - is that of a good tenor singer, like Pavarotti. Chicago Stories, though, is more than just writing new notes for old instruments. It's also about finding new ways to use them. Instead of a death scene, or the underworld, or consort, two of the Chicago Stories composers, Amos and Heidi, will use sackbut in their compositions. Amos makes use of it as he explores the world of the Alvarez Brothers and the Latin jazz scene in Pilsen; Heidi relates the experience of women crushing the glass ceilings. Perhaps through this project, the sackbut can not only pull us into the deep, dark unknown, but push us into a new ascent. Paul Von Hoff rehearses for Chicago Stories, alongside cornettist Bill Baxtresser and gambist Anna Steinhoff.